You have a wedding next week and no time to buy a new dress. Or perhaps you have the time, but not the money – why spend hundreds of dollars on a dress you will probably only wear once? 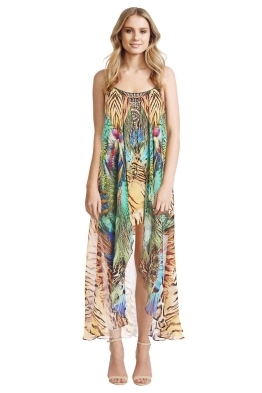 Maybe you are a FIFO with limited opportunity to go shopping for a glamorous new dress. Or perhaps you just hate trying on dresses while a queue of women snake behind you all wanting you to hurry up. For these women, and everyone else, there is now a fabulous new hire service where you can select a designer gown online and have it delivered in perfect condition, to your front door before your next special event. After the event, you don't need to worry about dry cleaning (they take care of that) – you simply pop the dress into the pre-paid postal bag provide and drop it into your nearest Post Office or Yellow Mail Box. Welcome to Glam Corner, the designer dress hire service that operates around the country. But for every woman who ever wore an ill-fitting dress there is one obvious question: How do you know if you will get the right size? 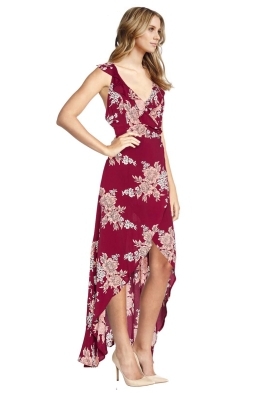 They have that covered as well, with their Try On Service – where you can have two dresses for only $30. You keep them for a day to try on at your leisure, and return them (with the tags on) within 24 hours. Additionally, Glam Corner also offer a fit guarantee – if the dress doesn't fit or you just don't like it, then you can return it with the tags on within 24 hours and they will either send you a new dress (or different size) at no extra cost, or refund your money. You can also read reviews from other customers to get an idea of how the dresses fit based on body shape and size. It's almost like having your bestie along for a second opinion. Everything is made as easy as possible. You can hire accessories such as fascinators, handbags and jackets, and buy little helpers (such as shapewear) and jewellery. There is a team of stylists available to help you - either with a quick phone call or email to answer a question, or you can book an exclusive one-on-one chat with a stylist who will call you at a time suitable for you, and help you choose the right dress for your next event. Glam Corner offer a large range of top-quality, high end designer dresses from famous names across the globe, including Alex Perry, Manning Cartell, Sass and Bide, Costarellla and Camilla. 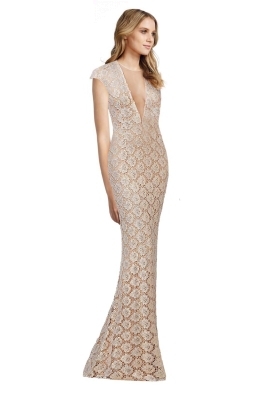 With over 800 dresses in more than 330 styles, there are dresses for weddings, formals, cocktail events, dressy work dinners, mother of the bride, graduations dinners and more in both knee length and full length styles. For plus size girls (anyone larger than a size 14) the range is currently limited, but steadily growing. New dresses arrive every week, and they are highlighted on both the website and their Facebook page so you never miss the newest look. In fact, Glam Corner are hoping to double their collection by mid-2016. The hire fees are very reasonable ($59 to $479, with most under $200) and include return postage, dry cleaning costs and $100 insurance in the case of accidental damage. Delivery costs $7.95 and the dresses arrive via express mail, boxed and wrapped carefully (the try on service does not have any shipping costs). If you are lucky, you may find some samples and coupons included in your box as well. Glam Corner offer their service across Australia, and they can deliver anywhere there is a mail box or PO Box. In Sydney, they offer a same-day delivery service for girls who just can't wait (or who left it to the last minute) but in all other states, dresses can arrive within 1-2 business days (add an extra day or two for Perth). You can choose to hire for a 4 day or 8 day period, meaning you can elect to have your dress arrive a few days before the event, and you can leisurely style and accessorise your outfit without stressing about leaving things to the last minute. Are you wondering about the $479 hire fee? It is for an ultra exclusive Herve Leger Danae halter neck mini bandage dress which retails for almost $3,000. Imagine wearing that to your next special event. What a terrific idea. My husband used to get invited to a onve a year hiend fund raiser. It was expected the leadies would wear a new dress every year and it made it a very expensive outing.